Resident Artist Abby E. Gross is a jazz saxophonist and music educator, originally from Somerset, PA. She is currently the Music Teacher at Pittsburgh Milliones University Prep in the Hill District. As a jazz saxophonist, she has played with all of our best known Pittsburgh players, such as Roger Humphries, Dwayne Dolphin, and Tony Campbell, as well as regional and national acts. She earned her bachelor of music education in 2010 and her bachelor of music performance in 2012, both from Duquesne University. Resident Artist E. Ron Horton began playing trumpet as a teenager in Wilmington, Delaware under the direction of Tony Smith and Jim Satcher. He earned his bachelor of music from the University of North Texas and a masters and Ph.D. from the University of Pittsburgh. Dr. Ron was a member of the United States Air Force Band of the West in San Antonio, Texas from 1998 through 2002. While in the military he performed all aspects of trumpet, from lead with the jazz band to principle with brass quintets. He also spent six years on the faculty of Arkansas State University as the Director of Jazz Studies before returning to Pittsburgh. Ron has performed with the Pittsburgh Jazz Orchestra, the Roger Humphries band, as a member of the New Orleans Jazz Ramblers and as a freelance artist throughout the country. Want to hear Abby and Ron LIVE and up close? Of course you do! Check out our Events page for their list of upcoming gigs. 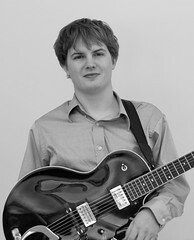 Mike Borowski is a guitarist, composer, arranger, collaborator, and educator. He has developed a wide-ranging vocabulary that can be heard in his playing and compositions. 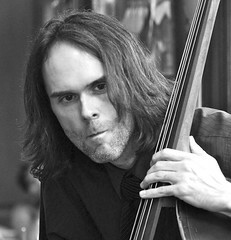 As an active performer, Mike is a founding member of Pittsburgh’s premier tango ensemble, Cuidado, as well as Choro E Vinho, Pittsburgh’s only Brazilian choro group. He also plays with Dazzletine, a high-energy glam rock band, and Kinetic, a soul-full afro-pop group specializing in Afro-Cuban music. Mike attended Duquesne University where he received his Bachelor’s and Master’s degree in guitar performance. He has studied with many incredible musicians including Joe Negri, Tom Kikta, Sean Jones, Mike Tomaro, Ken Karsh, and Mark Koch. Jason Rafalak is a musician and music therapist working at Friendship Academy with students with emotional/behavioral issues. He has played upright bass for fourteen years and electric bass for nineteen years with a variety of artists, in styles ranging from jazz to folk to hip-hop. Originally from Albany, NY, he attended Nazareth College in Rochester for music therapy, studying jazz and classical upright bass while working in schools and psychiatric settings. He moved to Pittsburgh in 2006. Jason uses his skills as a musician and educator to teach students about music history (including jazz), music technology and production, and instrumental instruction. While not working as a music therapist, he is actively performing and recording music with artists such as Anqwenique Wingfield, Joy Ike, Joe Sheehan, and Brad Yoder. A native of Pittsburgh, Anqwenique began her music studies at the Afro-American Music Institute where she now teaches voice and piano. She also teaches at East Liberty Presbyterian’s Hope Academy. She received her Bachelor of Fine Arts in Vocal Performance from Indiana University of Pennsylvania in 2009. She has recently entered the jazz scene performing with some of Pittsburgh’s greatest jazz musicians. Her unique style consists of jazz standards, neo soul, and a bit of gospel in a beautifully controlled and soulful sound. In addition to growing as an artist, her goal this year is to record an album. Joe grew up near Pittsburgh and graduated in 2002 with a Bachelor of Arts in Music Technology (Composition). During graduate studies at Indiana University (Bloomington, IN), he studied piano, took classes with David Baker, and played in two funk bands. His "classical" compositions won several national awards and performances throughout the East Coast and at Aspen, CO. In 2008, he finished a Doctorate of Music in composition, and then spent six months in Ghana, West Africa to study traditional music, dance, and culture. Back in Pittsburgh since 2009, he now teaches music at Duquesne University and CCAC Boyce, and plays gigs all over town. One goal he has this year is to build support for his two new ensembles: TRIO+ and KINETIC. Calling all emerging jazz artists of Pittsburgh! Click 'Apply' below to learn more about the application process.